The fresh, clean taste of New York's water is legendary. Less well known is the fascinating story of the massive program of exploration and construction that was required to achieve such purity. The story of that monumental undertaking is told in Water-Works and illustrated with an astonishing archive of drawings and photographs documenting the design and construction of dams, reservoirs, aqueducts, and tunnels. This complex system brings millions of gallons of water to the city every day from rivers many hundreds of miles away. Kevin Bone, Gina Pollara, Paul Deppe, and students from the Irwin S. Chanin School of Architecture of the Cooper Union spent nine years cataloging and preserving this remarkable archive, which is held by the City of New York Department of Environmental Protection. 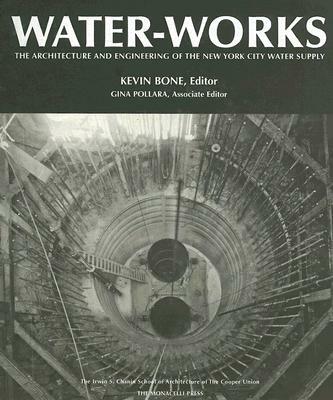 Essays by Bone, former DEP commissioner Albert F. Appleton, and scholars Peter H. Gleick and Gerard Koeppel trace the history of the system from its beginnings in the mid-1800s to the current construction of City Water Tunnel #3. The story of New York's water system is illuminated in expert detail on the pages of Water-Works, revealing the beauty and power of these magnificent works of public architecture and engineering. Kevin Bone is a professor at the Irwin S. Chanin School of Architecture at the Cooper Union and a founding partner of Bone/Levine Architects. He was the general editor and a contributor to "The New York Waterfront: Evolution and Building Culture of the Port and Harbor" (1997). Gina Pollara was the associate director of the Irwin S. Chanin School of Architecture Archive until September 2006. She was a contributor to "The New York Waterfront" and prepared the revised and updated edition in 2004. Albert F. Appleton, a former Commissioner of the New York City Department of Environmental Protection, is a Senior Fellow at the Regional Plan Association (RPA) in New York City and a Visiting Fellow at the City University of New York Institute on Urban Systems (CIUS).